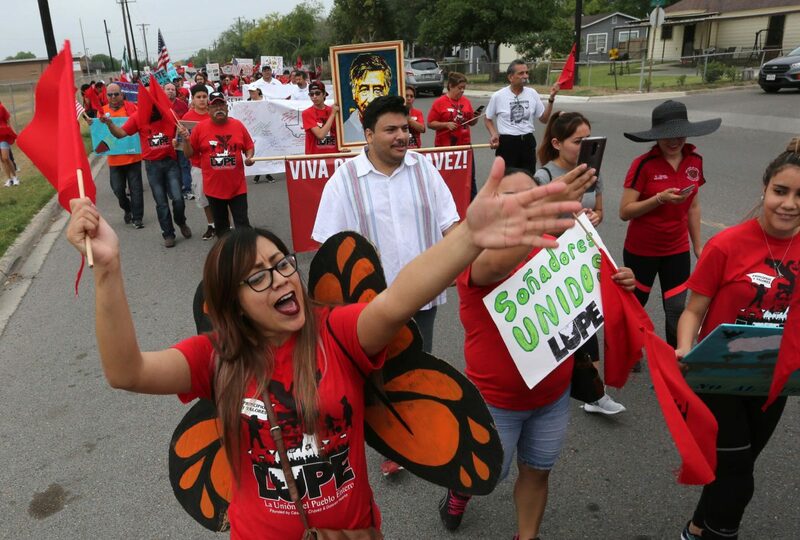 Julieta Paredes, who has Deffered Action on Childhood Arrivals status, marches during LUPE's 15th Annual Cesar Chavez March Saturday, April 7, 2018, through San Juan. SAN JUAN — Francisco Martinez remembers using a communal, rinsed-out aluminum oil tin to drink water out of an open barrel after a long day working in the fields. The water was typically warm from being in the sun and portable restrooms were nowhere in sight. Today, farm owners are legally obligated to provide those minimal necessities and a fair wage. “We haven’t quite got there yet, but we’ve progressed a lot since we’ve started,” Martinez said in Spanish, standing in front of a pickup truck at the end of the 15th annual César Chávez March in San Juan. Francisco Martinez, right, marches with his grandson Armando Perez, 13, during La Union Del Pueblo Entero's 15 Annual Cesar Chavez March Saturday, April 7, 2018, in San Juan. Martinez said he was a body guard for Cesar Chavez for several years as a member of the United Farm Workers while he lived in California. 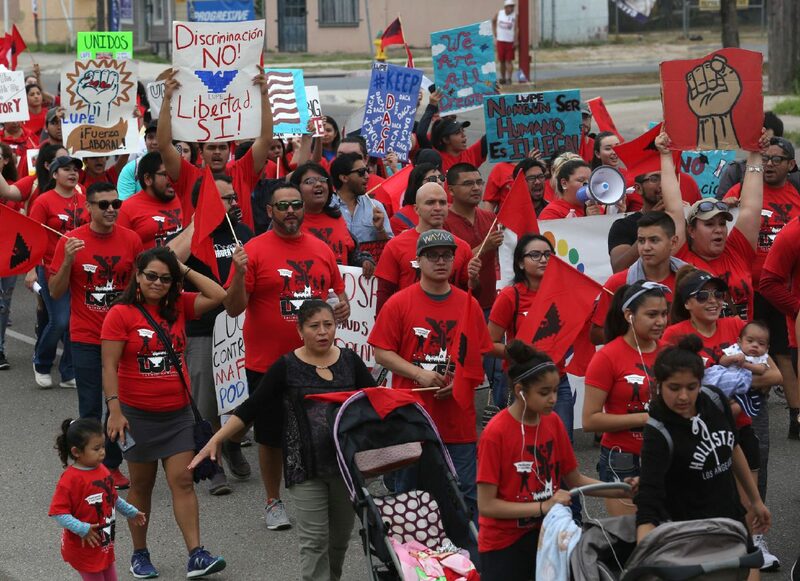 People march during LUPE's 15th Annual Cesar Chavez March Saturday, April 7, 2018, through San Juan. 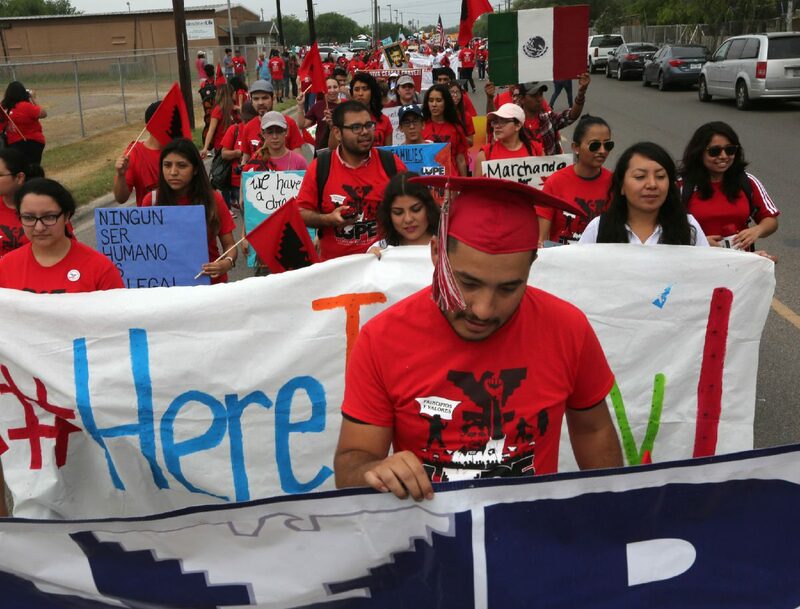 Julio Pena, 24, leads a group of people with Deferred Action on Childhood Arrivals status at the front of LUPE's 15th Annual Cesar Chavez March Saturday, April 7, 2018, through San Juan. 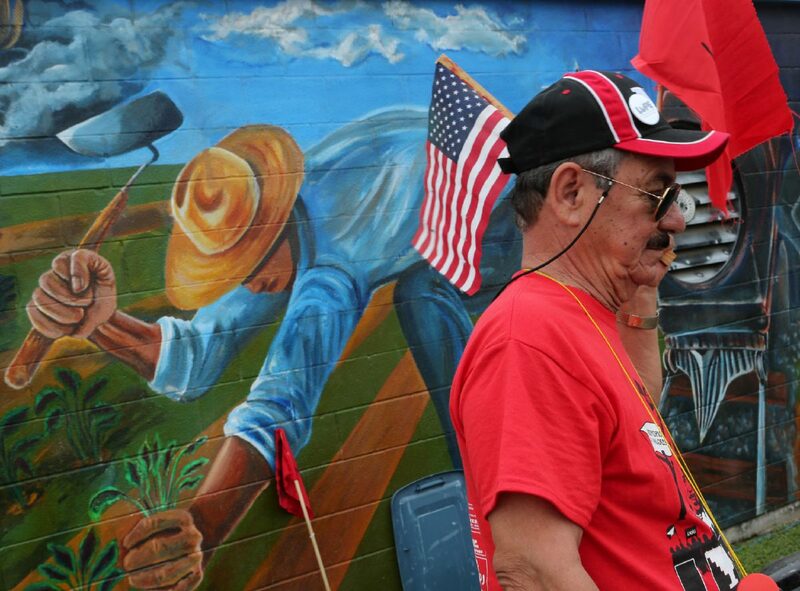 LUPE's Sergio Narvaez stands near a farm worker mural before the start of the 15th Annual Cesar Chavez March Saturday, April 7, 2018, through San Juan. He wears a yellow fishing shirt, a straw hat and thick sunglasses. The now 78-year-old gets around with a cane, but back in 1964 he was trusted to be a bodyguard for César Chávez. Gregoria Gonzalez, an agricultural worker and member of La Union del Pueblo Entero, stood at San Juan Municipal Park, wearing a red shirt with the signature United Farm Workers logo, holding a portrait of Chávez over half her size. Gonzalez was joined by roughly 1,000 people who marched from San Juan Municipal Park to LUPE’s San Juan office — a roughly 2-mile walk. Gonzalez’ son, an art student at the University of Texas Rio Grande Valley, painted the portrait for her. She’s worked in agriculture for 20 years and has had her share of obstacles, she said. “He always fought for human rights, especially of the workers,” Gonzalez said in Spanish. Though now farm owners are legally obligated to provide fresh water and portable restrooms, that’s often still not the case, she said. This year the march borrowed the support of activists from across the state. 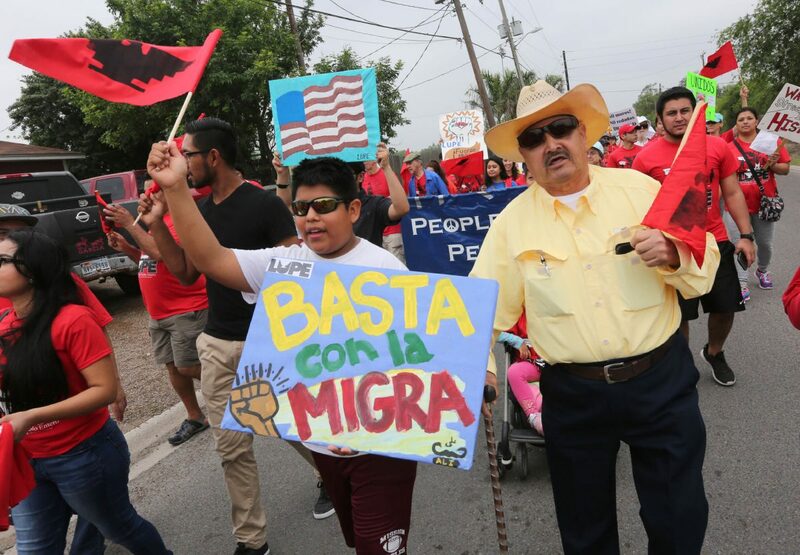 In light of the recent approval of Senate Bill 4, a group of immigration activists are visiting Texas border cities to “inform Hispanic communities about SB4,” said Fernando Garcia, executive director of the Border Network for Human Rights. SB4 would allow Texas law enforcement to inquire about immigration status and cooperate with federal immigration authorities. Opponents of the bill say it opens the door for racial profiling and could discourage certain individuals from reporting crime to law enforcement. The caravan of activists have been in the Valley since Friday. They’ve been meeting with local officials and providing “Know Your Rights” workshops and forums open to the community. SB4 is the latest of many “attacks against our communities,” Garcia said. The president’s rhetoric toward Hispanics and the plans to build a border wall are a few others he mentioned.